This is old version Crossy Road 1.8.2 apk for Android, you can install it if you want to downgrade or install old app. It is top Action apps from Yodo1 Games. You can pick one of them, but chicken is preferable. The obstacles consist of river, road, grass, and train. You can go or step back after moving forward. This rule makes player to think carefully before go ahead. Another interesting side is eagle. Player cannot stay long time on some places. Character should move or eagle will catch it. This game is very enjoyable and funny. Developer offers more than one hundred characters. You could obtain several of them directly after solve certain level. Player can do trading with coin. It is similar with online game. You spend some coins to buy mascot. To receive more coins, there are several ways. Using real money is the easiest way. Coin is game currency so you just exchange with your money. Others ways are watching advertisement and solving quest. This game is free so you should cooperate well to obtain more coin. 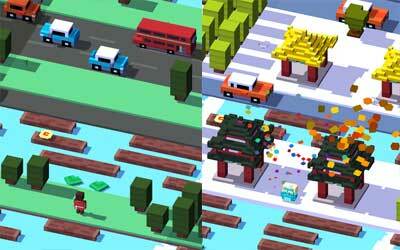 Therefore, Crossy Road for android is the best game to enjoy your leisure time.